Forgive the lack of posts last week it was a frantic one – two weeks to go until we debut the collection in Paris and still we have no products (its sending me grey). Everything apart from one light arrives end of this week – I HOPE. If not its just me, Maud and a zillion poodles on the stand. Its covered in cotton so way cheaper than leather it shouts English country house like no other sofa I know. 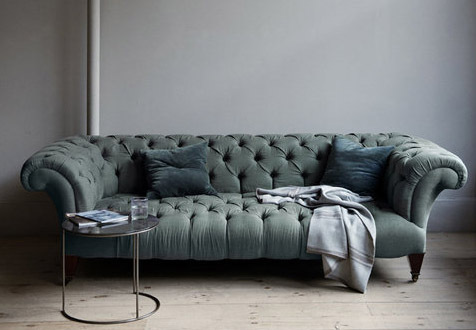 Sofa’s are one of the hardest things to buy being somewhat large they totally frame the way your space will look so its important to get it right. We haven’t had a sofa on our lower ground floor for what must be 5 years now just because I haven’t quite seen the right one. Hopefully with a bit of arm twisting on hubby’s part (not great timing since the show is proving rather costly I might in a day or two have a vintage beaten up old chesterfield).